Hmmmm . . . Let’s have a look at what she really said. Speaking at a summit of the wives of African leaders in Dar es Salaam on Tuesday,Michelle Obama and Laura Bush commiserated on the constrictions of being first lady and how hard it is to talk about substantive issues when people are focused on your hairstyle. We now await the next totally misleading headline from the Drudge Report. 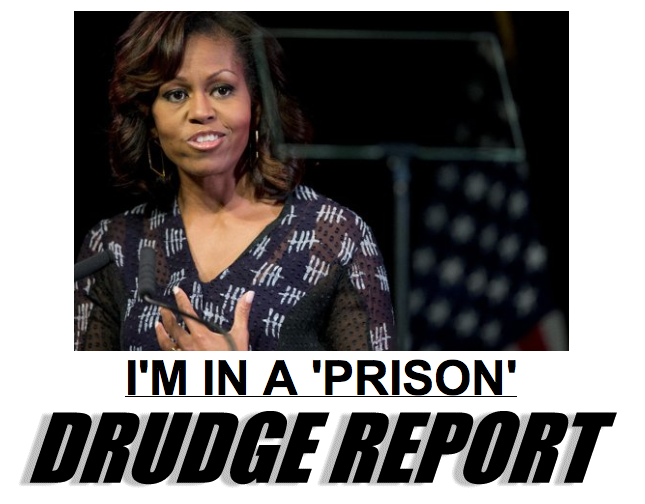 This entry was posted in In the News, Journalism, Politics and tagged Drudge Report, Matt Drudge, Michelle Obama, Prison, White House by stephenbromberg. Bookmark the permalink.